"To find answers, they look back into our eyes and listen to our words. Do they hear us speaking faithfully and hopefully, despite the tribulations of our times? 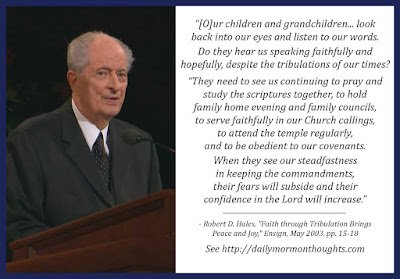 "They need to see us continuing to pray and study the scriptures together, to hold family home evening and family councils, to serve faithfully in our Church callings, to attend the temple regularly, and to be obedient to our covenants. When they see our steadfastness in keeping the commandments, their fears will subside and their confidence in the Lord will increase. 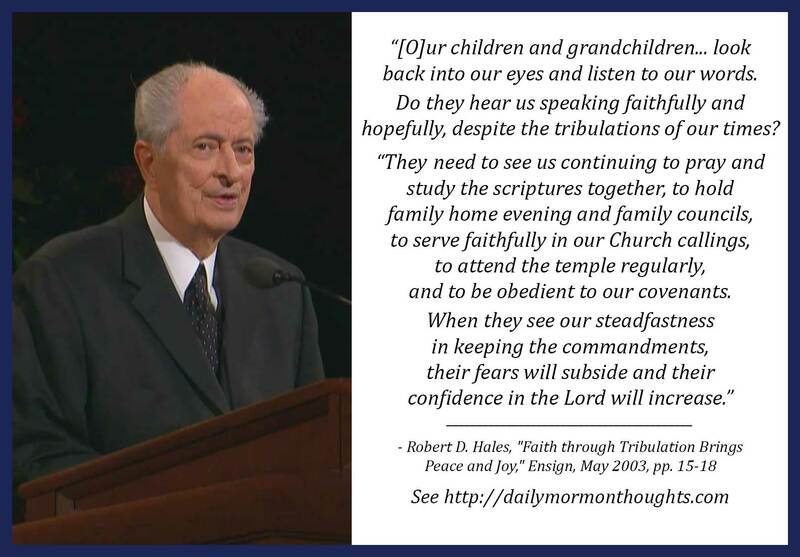 "By showing our faith through tribulation, we assure them that the fury of the adversary is not fatal." Elder Hales shares a valuable reminder and caution. It's easy to be discouraged in the midst of "the doubt and fear of our times." We may have concerns for our nation, our economy, our schools, the safety of our neighborhoods, our international relations—so many things. And those perils are increasing, and will continue to increase, in our day. But what do we teach our little ones, who look to us, by how we respond? And not just the little children, but perhaps those who don't share our faith and understanding of God's plan? When we talk in overly worried and fearful tones, we demonstrate a lack of faith in God and in His ability to carry us to safety. 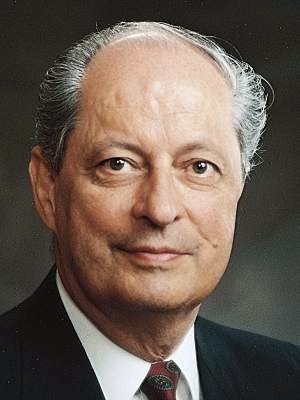 And so Elder Hales counsels us, as the Lord has always counseled, "Be not afraid, only believe" (Mark 5:36) and let that belief shine in our words and in our actions. Truly, the example we show in our words and actions will help to bless and strengthen those around us more than we ever realize. There are always others watching, actively or passively; and one person's faith not only blesses that person, but when it is visible and demonstrated, it does more good than he or she can ever anticipate. Labels: actions, attitude, challenges, confidence, example, faithfulness, fear, Hales Robert D.